Really exciting news…..my good friend Baron Wolman is coming to Rollercon. I wrote about him in another post. Baron was the first chief photographer for Rolling Stone, and his classic photographs from that era grace many galleries and all of the Hard Rock Cafes. He was on stage at Woodstock, and you may have seen him on PBS recently when he introduced his photo book of that weekend. 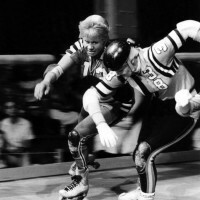 If you go to http://www.baronwolman.com, you will see the amazing photographs he has produced; ….he wandered into our arena one day and started taking Derby photos, and they are the basis of the classic book: “From Roller Derby to Rollerjam”……no one else has ever caught the game the way he has. At the top of his website click on “beyond rock” and you will get the idea. This is how he captured Joan Weston and Ann Calvello…..(do not copy this photo without his permission!) look at some of the other photos on his site. He recently published a book on “Groupies” which is absolutely beautiful. And he created the wonderful fashion magazine of the 70’s “Rags”. Although the greatest rock photographer, he is so cool. check him out at either at the Roll Models booth (#24), or at Brown Paper Tickets booth. You want to get a photo with the commish and with the Legend. I charge 19 cents…..I don’t know his fee. Baron will be at and part of our seminar at Rollercon.